Home > Publications > Factsheets and resources > What's the law? What's the Law? 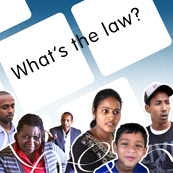 is a legal education resource for newly arrived migrants with limited English language skills. The What's the Law? kit contains 10 simple stories dealing with the most common legal issues experienced by recently arrived migrants and refugees. There are student activity sheets to support each story, and teacher answer sheets. This resource is suited for use in education sessions with ESOL (English for speakers of other languages) learners, as well as in community settings. You can view the stories and download the activity sheets, teacher answer sheets and the certificate of attendance below. Click on a topic below to view digital versions of the stories.